The area around brentwood mall is is currently going a major revitalization. With developments like SOLO District by Bosa already underway the vision for the Brentwood Mall area of Burnaby is coming into focus. 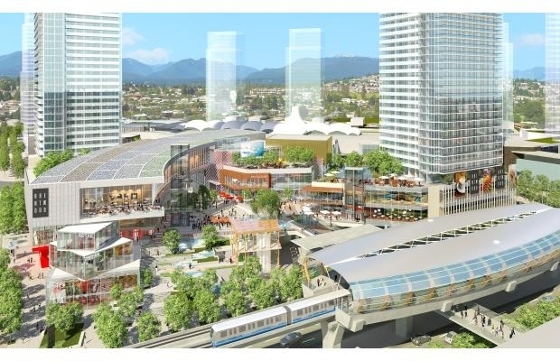 When completed, the front 10 acres of the 28-acre project will connect directly to the Brentwood Town Centre SkyTrain Station at Willingdon and Lougheed. On the website of the developer, Shape Properties, the mixed-use project is described as “an amphitheatre of activity.” For residents of the two residential towers that will flank the plaza, it will be “an outdoor living room.” Visitors will experience “an extraordinary sense of arrival” as they step out of the Millennium Line station and into a one-acre public plaza lined with shops, restaurants and open-air patios. Shape plans of developing the area with mixed use development. There will be many towers with areas on the bottom for things like restaurants and coffee shops. It also includes another new development called "Soverign" by Bosa which will add approximately 202 new residences to the area.